Bob Dylan closed his triumphant debut set at Newport by calling out Joan Baez and Peter, Paul and Mary, to join him in "Blowin' in the Wind." (PP&M's recording of the song had reached no. 2 on Billboard's Top 100 singles chart a few weeks before the festival.) 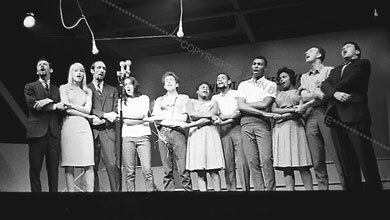 For an encore, they were joined by the Freedom Singers, Pete Seeger, and Theodore Bikel in a moving rendition of the civil-rights anthem "We Shall Overcome" that had the sell-out audience of 13,000 on their feet, singing along.